Can a natural pain reliever bring you fast and effective pain relief while reducing inflammation and at the same time improve your health? Yes. Call it the wonder of nature. We all get headaches, or other aches and pains. It happens. Sure, you can reach for an over the counter pain medication. But for more and more people, they are not satisfied with their usual pain medication. Why? For one thing, they all have side effects ranging from mild to very severe. And none of them help to build health. In fact, one of them is a leading cause of liver failure* More here. No side effects here. Only side benefits. 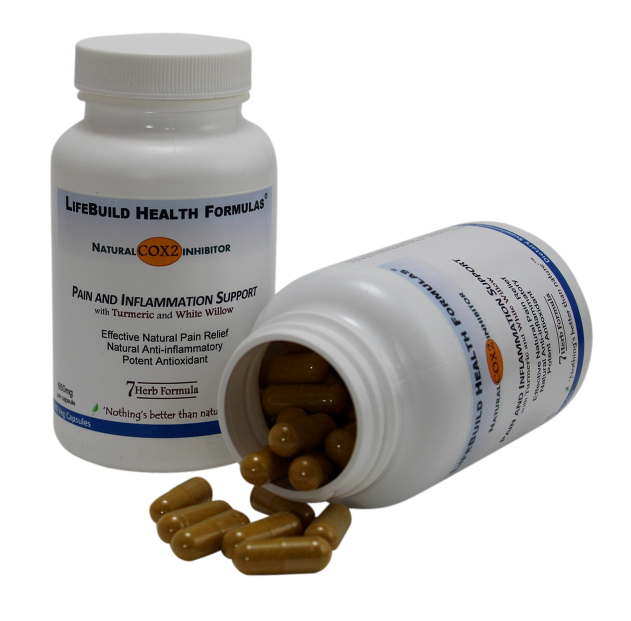 The herbal Pain and Inflammation Support formula is a unique and effective blend of seven of the world's finest herbs traditionally used to relieve pain and reduce inflammation. They have centuries of reliable use and are safe to use on a daily basis. 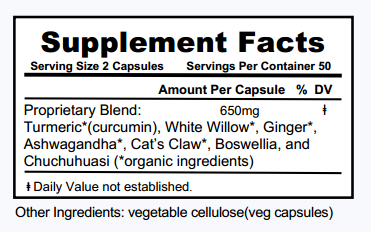 It is a potent combination of Turmeric, White Willow, Ginger, Ashwagandha, Boswellia,Cat's Claw, and Chuchuasi, providing several different ways to achieve relief and reduce swelling and inflammation. It helps to relax muscles, as well as address the negative side effects of pain such as stress, loss of appetite, poor digestion, fatigue and even liver stress. It can be used for all types of pain or inflammation such as headaches, joint pain and inflammation, PMS, muscle strain or any other pain. Suggested Usage: As a dietary supplement, take 2-3 capsules once or twice daily. Note: Do not take if on blood thinners or are allergic to aspirin. If pregnant or nursing, have a medical condition or on medication, consult with your doctor before taking. Turmeric root is best known as the Indian spice used in traditional India cuisine. It may be the best natural anti-inflammatory in the herbal kingdom as well as naturally relieving pain. Curcumin is considered the most active component of turmeric, but it is only one of many chemicals in whole turmeric that provides health benefits. While curcumin does indeed offer substantial benefits, it's the synergy of all the components of turmeric working together that is nature's magic, not just curcumin. That's why we use whole organic Turmeric root, and not just curcumin. Whole turmeric has also shown to possess anti-cancer properties, supports the liver and cardiovascular system and is one of the most powerful antioxidants in nature. For more on turmeric click here. White Willow bark contains salicin, the original aspirin. It was later isolated and synthesized into acetylsalicylic acid, or as we all know it, Aspirin. White Willow has been used since the time of Hippocrates for pain and inflammation relief. Aspirin is well known to cause stomach upset, but since White Willow has many chemical components, not simply one single isolated chemical, it will not cause stomach upset, though it is still very effective and very safe. In fact, studies have shown White Willow to be as effective as aspirin with lower doses that actually last longer! Salicin is not the only pain relieving component in White Willow, however, so taking the whole herb as we do offers greater benefit. Studies have also identified many other constituents in White Willow that reduce fever, are antiseptic, and even boost the immune system. For more on how herbs work, click here. Ginger. We all know ginger as the popular kitchen spice. But not everyone knows of its varied health benefits. It is often used for effective relief of motion sickness and nausea, but studies show it is also a powerful anti-inflammatory, and wherever pain is, inflammation is as well as a natural biological response. So whenever you can reduce inflammation, you will also reduce pain. Another big plus: because ginger is spicy and supplies heat like cayenne or black pepper, it effectively inhances absorption of all the other ingredients. Ashwagandha is a first class tonic and adaptogen herb. 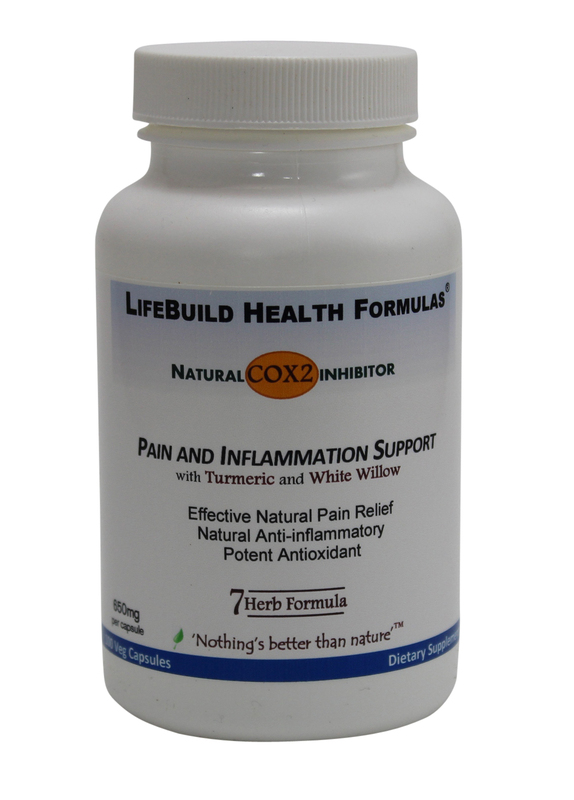 But it is also another natural COX2 inhibitor, helping to reduce pain and inflammation. Ashwagandha also helps to lower the stress in the body that can be a very debilitating side effect of pain. It is highly regarded for its extremely broad range of uses and is a key ingredient in our Ultimate Invigorator formula. Boswellia is a standard inflammation remedy in Ayurvedic medicine from India and has been in use for thousands of years. It has the natural ability to turn off pro-inflammatory cytokines and mediators associated with pain that initiates the whole process. Cat's Claw comes from the Amazon rainforests, and has shown to reduce pain and inflammation as well as stimulate the immune system. It has anti-cancer properties and is used in the Amazon region to 'normalize the body.' An incredible multifaceted herb with many diverse uses. Chuchuasi. You don't often hear of this herb in America, but it's just a matter of time. Chuchuasi is another herb from the Amazon that has been used for centuries for pain, as an anti-inflammatory and as a muscle relaxant. It also supports the adrenal glands, a very useful property, because the stress from pain can be very taxing on the adrenals. I take the Pain and Inflammation Support for a variety of reasons. It helps me with muscle soreness, headaches and body aches. I've noticed huge improvements with muscle recovery after workouts and even relaxation. I've had eczema since childhood and after a few months on this product, it has cleared my eczema and it has not returned. I have been taking it daily for well over a year. I have noticeable improvements in my skin, nails and hair. It has also helped me to maintain my weight. I highly recommend this product and could not imagine life without it! Great product! Definitely a contributor to a better overall sense of health and well-being. I am larger than average so I take double the recommended dosage, but that is something you can adjust based on your activity level, body mass, and athleticism. I take this after workouts and noticed a reduced soreness in both muscles and joints. I have also noticed that my hair, nails, and skin are also looking better. This is a great product to incorporate into your health supplement consumption!